Video of the gyrocopter sitting on the U.S. Capitol grounds. Capitol Police have not identified the suspect, but a Florida postal carrier named Doug Hughes took responsibility for the stunt on a website where he said he was delivering letters to all 535 members of Congress to draw attention to campaign finance corruption. According to the Tampa Bay Times, Hughes' letter to lawmakers said, "I'm demanding reform and declaring a voters' rebellion in a manner consistent to [U.S. founding father Thomas] Jefferson's description of rights in the Declaration of Independence." 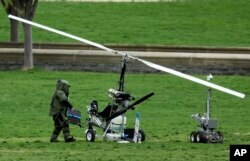 A member of a bomb squad checks a small helicopter after a man landed on the West Lawn of the Capitol, April 15, 2015. The gyrocopter might qualify as what the Federal Aviation Administration calls an "ultralight'' aircraft. These aircraft weigh under 254 pounds empty, have a fuel capacity of 5 gallons or less and aren't capable of flying faster than 55 knots. The FAA doesn't certify the safety of these aircraft, and their pilots are not required to have a license. In January, a small "quadcopter'' drone crashed onto the White House lawn. The man who was operating it did not face criminal charges.